If there were to be a vote by the 7 billion of us alive today plus the other 100 billion of us (give or take) who have ever walked the earth, the one thing we would of course unanimously agree on is that the best dessert of all time is Key Lime Pie. Which leads to the natural question: where did this creation come from? Did Key Limes and graham crackers become more than friends one day, combining two great families of tart and sweet lineage? Seems plausible. 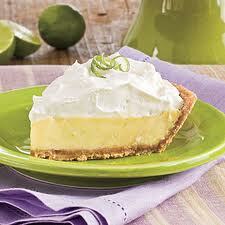 But consensus seems to be that that the Key Lime Pie was born in the late 1800s at the hands of a cook in Key West, Florida, who built on the work of a dessert created by local fishermen. In recognition of its invaluable contributions to taste buds everywhere, Key Lime Pie was made the official pie of Florida in 2006. No doubt further accolades are not far behind.